An idyllic place of peace covering nine acres. A visit to Grandma's Garden is a unique and fascinating experience. It will be entertaining, informative, educational and fun. Open Wednesday and Sunday 10.30 am til 4.30 pm. Grandma's Garden encompasses nine acres of mature grounds and new planting, the garden is virtually a miniature nature reserve, which has received the David Bellamy Gold Award for Conservation, it was officially opened by him in 2004. The garden also received a Special Award of Distinction in 2009. The garden includes seven small gardens, each one designed to stimulate and delight the senses:a Sight and Light garden, which is particularly enchanting to visitors with hearing impairment;a garden of Sound, Scent and Touch, a sensory joy, especially appealing to those with sight impairment;Mother Nature's Magic Garden, focussing on edible plants and healing herbs;a Children's Enchanted Garden with plenty to stimulate young imaginations;a Garden of Other Realms encouraging an exploration of the great literature;a Celtic symbol of infinity;and Humanity's Destiny Garden envisaging the unity of man. Each small garden has a poem to foster reflection of the human condition. The gardens have been specifically designed for those with lesser abilities. The main paths are hard topped making them particularly suitable for wheelchair users or those with sight impairment. 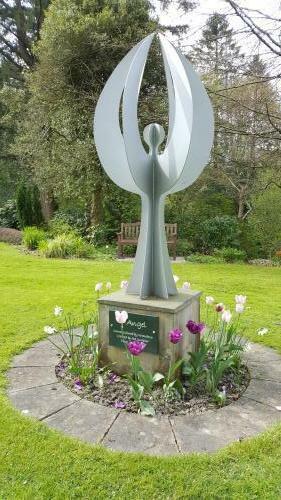 Throughout the grounds there is a wonderfully eclectic collection of sculptures, symbols and areas representing elements of peace, compassion, spiritualism and celebration of life. For tree lovers, the Arboretum consists of more than fifty species of tree, including a yew which is more than 400 years old. A wheelchair-accessible wildlife reserve in miniature, set in 9 acres of mature grounds with views of the Dyfi Valley, featuring 7 sensory gardens;a children's garden exploring story and rhyme characters;a riverside walk;lawns;wildlife pond;bog garden;a stone circle and spectacular sculptures. Spring bulbs, primulas, azaleas, rhododendrons, rose arches, herbaceous, herbs, orchard, willow arbour and herb seat. Year-round interest. Featured on BBC I Love Wales. Opened July 2004 by Professor David Bellamy. It was also featured on ITV's A Little Piece of Paradise in 2010. Grandma's Garden is set within the estate of Plas Dolguog Hotel, the gardens encompass mature and new planting, wildflowers and wildlife, sculptures and carvings, with strategically placed seats to sit and enjoy the vistas and views. In Spring the daffodils, snowdrops, bluebells and scented azaleas delight the senses. Fifty species of tree and shrub create a stunning arboretum. Small gardens designed to speak through the language of the senses with which we are each blessed include a garden of sound, scent, touch, a garden of sight and light and a children's enchanted garden. A stone circle, wildlife pond and many sculptures make the garden a unique and fascinating experience. Diana Rhodes from Grandma's Garden:"Back in 1996, I set up the 'Seed of Life Peace Foundation' to organise a Gathering of Native Americans who were coming to Plas Dolguog to perform a Sun Dance. People attending the Gathering were asked to bring plants with them. During one of the gatherings, we decided to create a Seed of Life symbol using white stones and that now forms the focal point of the garden today. Everyone who came was asked to bring a plant and as the garden grew and grew, we decided to create a Peace Garden. The philosophy of the garden was to create a place where people could come and just be. It has also been and will continue to be the catalyst for others around the world to create Peace Gardens, be they window boxes or large estates. The original idea for a Peace Scroll, with contributions from His Holiness the Dalai Lama, Prince Charles and Nelson Mandela, religious and spiritual leaders, and many groups and people including children, became so big it was published as a book. His Holiness the Dalai Lama wrote the foreword for one of these books, which are available during your visit.